Sunday Morning Bible Study is THE Place to find YOUR Place at Green Acres. You may begin your search in the SMBS Guide, or with the Interactive SMBS Finder. 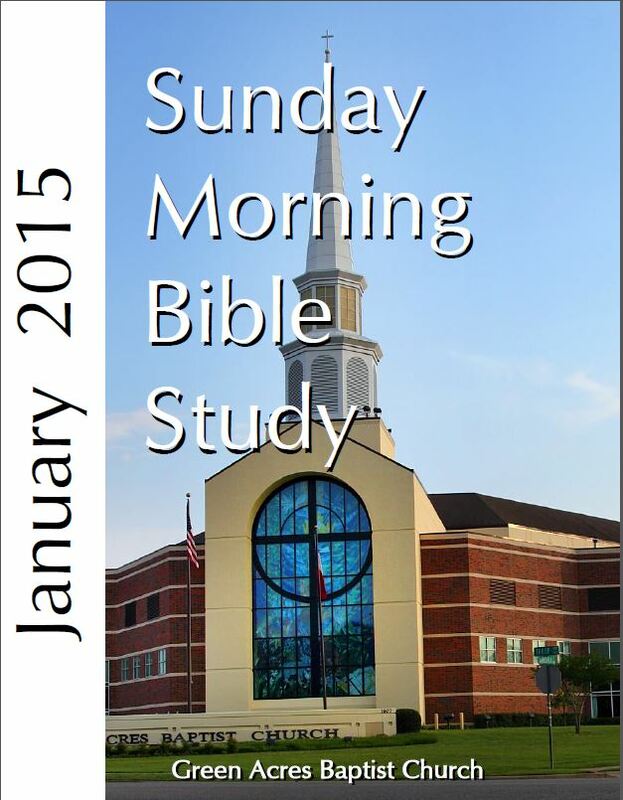 The new Sunday Morning Bible Study Guide, with class times and locations for the new Sunday Morning schedule will be available the first of March. As always, you'll see it in Life Support first. This Sunday, the Pastor continues his message series, "Treasure Truth," with the message, "The Magnetic Power of Your Treasure," 1 Chronicles 29:1-18. ARE YOU NEW TO GREEN ACRES? If so, I want to invite you to join me for a Pastor's Discovery Dinner one week from this Sunday evening, at 5pm February 15, in the Crosswalk Conference Center. This free, informative dinner is for all NEW MEMBERS who have joined GABC in the past few months. But it's also for any of you who may been new to GABC, but you haven't joined yet. This is the perfect occasion to learn about how our church is organized and what we believe - and to enjoy delicious food and warm fellowship as well. If you'd like to come, please stop by the room next to the Bookstore after worship this Sunday and make your reservation. GOD HAS A SPECIAL PLACE IN HIS HEART FOR WIDOWS. We want our widows to feel loved on Valentine's Day. So our WIN Ministry (Widows in Need) is hosting a special table in the Worship Center Foyer this Sunday morning. If you are a widow please stop by for a small love gift. This is our way of saying that you are special to God and to us! CHANGE IS COMING 3/29/15! We're making Sunday mornings simpler by going to two sessions -- Bible Study and Worship at 9am and then Bible Study and Worship at 10:30am. Help us spread the word! OUR FOUNDATIONS OF FAITH MINISTRY is dedicated to helping Believers attain a better understanding of the history and heritage of our faith. In the late spring of 2016 I will be leading a travel group to Europe so we can experience where some of the important events of the Reformation took place. If you're interested in adding your name to a list to receive information please call our Adult Impact Ministry at 903-525-1186. Where is your treasure? Check your heart. SOMETIMES I STILL SURPRISE MYSELF. Just about the time I think I've got things all figured out, something happens to prove that assumption totally incorrect. I know, because that happened again just last week. 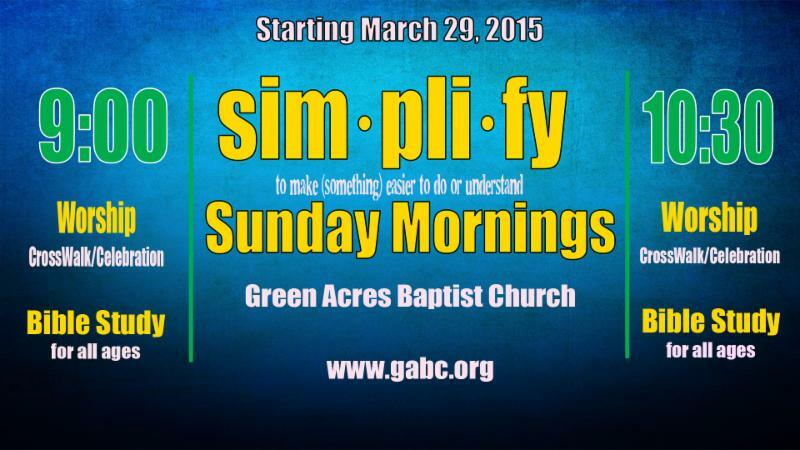 MOST OF YOU KNOW that we've been talking about our new SIMPLIFIED Sunday Morning Schedule for almost a month. In fact, this article has been devoted exclusively to that new schedule for the past four weeks. I actually thought we were doing a pretty job of getting the word out . . . Which brings me to last week. OVER A PERIOD of about 30 minutes, I had two conversations that convinced me that we apparently still have a LOT of work to do. The first conversation began simply enough, with the question, " Have we started that new schedule yet?" And the second, with an even simpler, although perhaps somewhat more frightening question, "What new schedule?" Now, the folks who asked these questions were not trying to be difficult; they were simply asking legitimate questions, to which they apparently had yet to hear the answers. HOWEVER, those conversations brought to mind the truth of a statement I made here back on January 18, "I have learned from experience that it takes quite a while to get the word out to a majority of GABC folks." And, apparently, these two conversations were simply a sampling of that fact in action. So, as part of our ongoing effort to continue to spread the message, here, once again, is the good news. ON SUNDAY, MARCH 29 (Palm Sunday), our new Sunday Morning Schedule will be SIMPLY, 9:00 a.m. Sunday Morning Bible Study and Worship, then 10:30 a.m. Sunday Morning Bible Study and Worship, with something for every member of the GABC Family at both hours. No more of the 8:15, 9:45, 11:15 conglomeration that has confused both newcomers and long-time members alike. THE INITIAL RESPONSE to the news has been outstandingly positive, stimulating all sorts of great questions, several of which we have answered right here. The details of the change are being deliberately worked out, and all of the information about new Sunday Morning Bible Study class times and locations will be available Sunday, March 1, in the new Sunday Morning Bible Study Guide, all leading up to the big day on March 29. IN THE MEANTIME, if you have questions, please don't hesitate to ask. But, the most important thing you can do in the interim is help us spread the news (and DO NOT ASSUME your friends already know) - Sunday, March 29, were Making Sunday Mornings Simpler, and there is a TIME and a PLACE especially for YOU. Songs of worship often become more meaningful to us as they are associated with, or remind us significant moments or experiences in life. This week's Moment to Worship is a prime example of that fact in my own experience. It was in the early 90's, and our son, Mark, introduced me to the song that is our feature today. Mark was in middle school, and was embroiled in that mix of emotions and confusion that so often surrounds the evolution into adolescence. When he mentioned that this particular song had spoken in a unique way to him, and to all he was experiencing, I knew I needed to listen. When I did, I discovered, "Place in This World" by Michael W. Smith, and joined my son in his unique appreciation for the message of this song, which you may understand more clearly from the lyrics here. Feels like I'm . . .
Show me I'm . . .
Now, I understand that the music may not be your "cup of tea" (remember, I warned you about that way back when we started this feature), and the styles may cause a few raised eyebrows (this was the 90's after all! ), but in one special moment, this song spoke to the heart of my son, and became just one of many of the influences that have brought him to become the phenomenal young man he is today. So, in my mind, every time I hear the song again, it is truly a Moment to Worship. I hope it may also be for you. Have a worship video you like to recommend for this feature? Most conversions come about as an outgrowth of friendship. All the expensive and well-designed programs of evangelism and church growth combined produce only a fraction of the results of simple friendship. In the words of Tim Keller, "Don't think in terms of what used to be called friendship evangelism. Think in terms of friendship. Your evangelism should be organic and natural, not a bunch of bullet points and agenda items that you enter into a conversation hoping to get to so you're almost like a marketer." Here's a good test of how well we love: Are other people glad to be with us?